These award recipients represent the highest standards of leadership and are respected and recognized as role models to peers in the field. • Serving as a mentor to the next generation. Ann O'Brien is a recognized thought leader in nursing informatics and clinical transformation. As Senior Director of Clinical Informatics at Kaiser Permanente, Ann focused on collaborating with clinical and IT leaders on intelligent standardization and strategic optimization resulting in improvements in quality outcomes and clinician efficiency. Partnered with the VA on the development of a Nursing Information Model Process. Participates in the Nursing Knowledge Big Data Science Collaborative with a strong commitment for transforming nursing documentation. Is designated by Modern Healthcare as a Top 25 Clinical Informaticist. Served on the National Quality Forum’s Patient Safety Steering Committee. Ann is Robert Wood Johnson Executive Nurse Fellow and a Fellow in HIMSS. Her passion is leveraging predictive analytics and inter-professional teaming to achieve evidence based, personalized care across the continuum. Judy Murphy is Chief Nursing Officer (CNO) at IBM Global Healthcare, and a member of IBM’s Industry Academy. She has a long-standing reputation of patient advocacy and maintaining a “patient-centric” point of view, and approaches her work with unyielding energy as well as passion and commitment to the healthcare transformation enabled by technology. Judy is a Fellow in the American Academy of Nursing, American College of Medical Informatics and HIMSS. She’s been a high-profile mentor for many, encouraging and supporting women throughout her career. As an active member of the women’s community, Jessica Kahn has been recognized for her national leadership, willingness to collaborate, and steadfast support for health IT adoption across the country. She was recently recognized by Fierce Healthcare as one of eight influential women in health IT and one of the top 25 “Doers, Dreamers and Drivers” by the Journal of Government Technology, as an innovator in the public sector. As the Director for Medicaid’s Data and Systems Group, Jessica oversaw approximately $5 billion in annual federal spending for state Medicaid IT and data projects. Through her leadership of the Medicaid EHR Incentive Program, over 202,000 providers received $12 billion+ in incentive payments to adopt, implement, upgrade and meaningfully use federally-certified EHR systems, as of July 2017. Recently, the US Public Health Commissioned Corps honored Jessica as the first speaker in a new series focused on the 400+ women in the Corps in which she shared tips and lessons learned as a female healthcare executive. Since her appointment to lead the Defense Health Agency (DHA), Vice Admiral Raquel C. Bono has spearheaded a number of strategic health information technology initiatives for the Military Health System (MHS), initiatives that are ensuring the readiness of 1.4 million military forces worldwide. create a comprehensive health IT infrastructure that provides a safe, secure, and reliable backbone for both military and private sector healthcare delivery around the world. specific functional commands leading nuclear forces, special operations, transportation and cybersecurity. During her tenure as U.S. Pacific Command Surgeon, she applied United National Security Council Resolution 1325 and the United States’ global leadership in advancing the Women, Peace, and Security initiative across relevant command engagements. This activity showcased the unique and model role the U.S. military plays in elevating the status of women and girls worldwide, and especially in conflict areas. 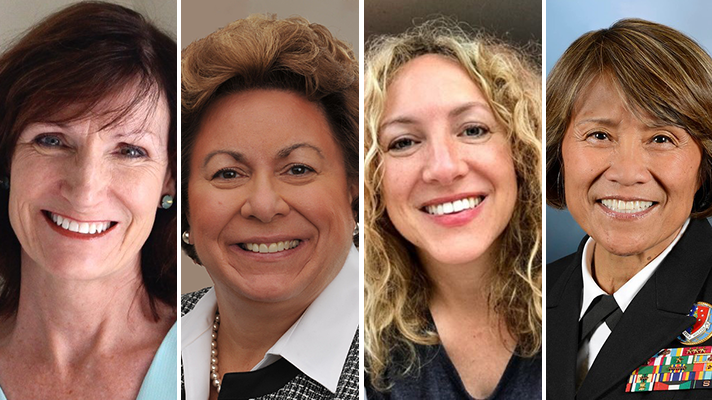 We invite you to join us on March 7 at HIMSS18 for our Women’s Reception to honor Ann O’Brien, Raquel Bono, Jessica Kahn and Judy Murphy.